Furman’s Series Multi-Stage Protection (SMP) delivers the purest AC power and the most comprehensive protection available, going far beyond what is found in traditional surge strips. With Furman’s Power Station Series, everyone can reap the benefits of unrivaled power purification and unequalled surge protection. For over 40 years, Furman has pioneered the development of AC power products for the most demanding audio, video, and broadcast professionals. Today’s overworked, outdated power grid delivers poor quality AC power. 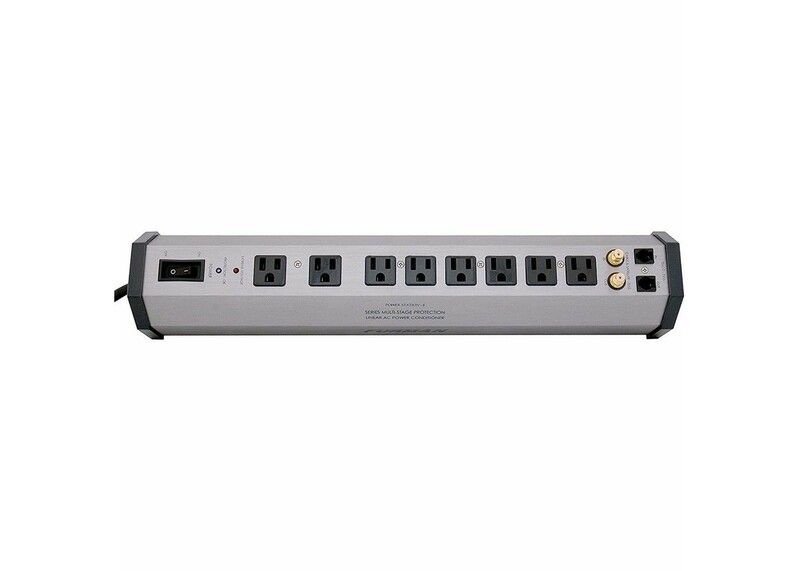 When connecting sensitive equipment to regular power outlets, AC noise masks and distorts critical signal information which cripples performance. This is why it’s more important that ever to purify or clean the AC powering your sensitive audio/video equipment. The PST-8 all feature Furman’s SMP circuit which incorporates Linear Filtering Technology (LiFT) and a high current TVZ-MOV to insure that any electronic device (including televisions, projectors, CD-DVD players, or computers) is fed clean, filtered AC power. This dramatically reduces noise, ensuring consistent peak performance from your equipment. Typical AC filters feature antiquated non-linear circuits. Though these multiple stage filters or power cleaners reduce some noise, they do so unevenly. In fact, they can add noise to your power line due to their filter’s excessive resonant peaking. With Furman’s proprietary Linear Filtering Technology (LiFT), AC noise is suppressed evenly, assuring maximum performance from your system. Additionally, today’s power grid commonly experiences numerous electrical surges and spikes on a daily basis. At best, these irregularities can degrade your equipment’s performance, and, at worst, can severely damage your entire system. Furman’s SMP circuit offers the highest degree of protection available without sacrificing itself or any of its components. Conventional AC conditioners employing older technologies leak voltage to circuit ground which can, in fact, aid in damaging sensitive digital circuits such as computer processors. Furman’s new technology, however, never directs voltage to the circuit ground further ensuring the safety of your equipment. Another feature that is unique to Furman’s SMP circuit is automatic extreme-voltage shutdown. Extreme voltages are statistically the most common, damaging AC event. The Extreme Voltage Shutdown circuit automatically turns off the unit when it is fed 137 volts or higher protecting itself and connected equipment from the extreme voltage. Only Furman offers this degree of protection! Add telco and cable /satellite transient voltage suppression, and you have what is, unquestionably, the most comprehensive protection available in a portable AC power conditioner.